Today we’re looking at a high-end Bluetooth speaker from Poweradd. The speaker boasts four drivers and IPX7 water and dust resistance, housed in a large yet portable body. It sounds like a winning combination for £50, but how well implemented are these ideas? Join us as we find out! The PowerAdd is a chunky speaker, with four drivers packed into a 227 x 88 x 67mm enclosure. The rugged design comes complete with sixteen false Torx screws, but the combination of thick polycarbonate and silicone should make it pretty resilient to daily use or abuse. The top of the speaker has five slightly spongy buttons. From left to right, we have: power, play/pause, volume down, volume up and multi-function (e.g. accept call). The buttons are highlighted by a white LED while the speaker is turned on. 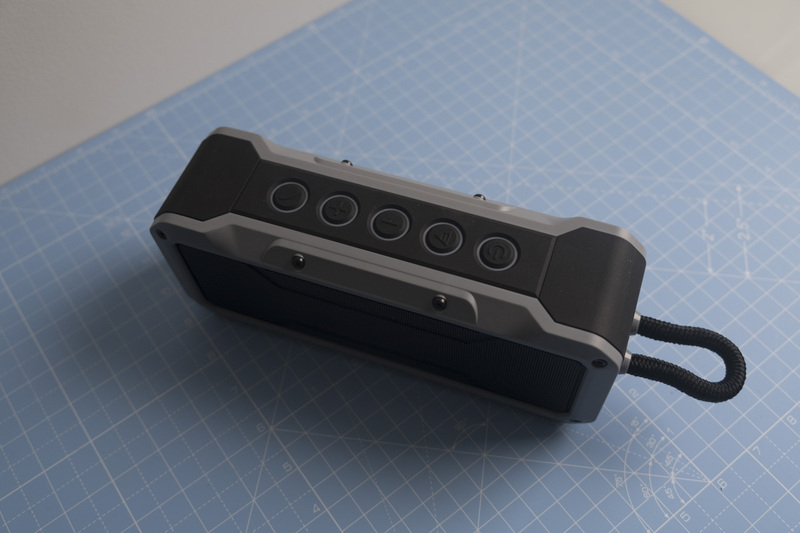 One side of the speaker has a large rubber compartment; inside you’ll find a Micro USB port (for charging the speaker), a full-size USB port (for charging other devices), a 3.5mm jack (for connecting non-Bluetooth devices) and four white LEDs (for checking the current battery level). On the other side, we have a permanently affixed piece of rope, which presumably could be used to clip the speaker onto a backpack or something. 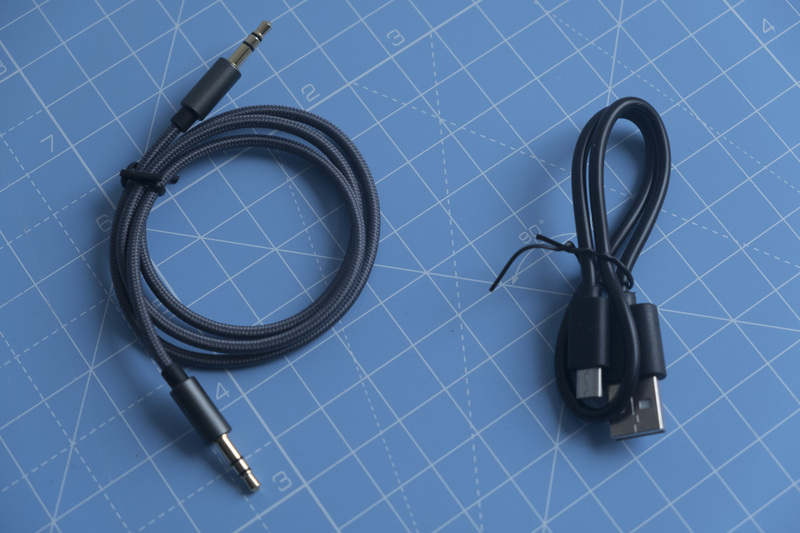 As well as the speaker itself, you get a nice braided 3.5mm audio cable and a cheap-feeling Micro USB cable. We tested the Poweradd speaker on one particularly boring afternoon, trying it out connected to a PC via 3.5mm and Bluetooth. For a £50 Bluetooth speaker that weighs over a kilogram, you’d definitely expect it to produce rich and room-filling sound. Happily, that’s exactly the case — we set the Bluetooth speaker to its maximum volume and had to retreat to minimum safe distance and wait until the song ended before we were able to turn it down again — it’s that damn loud. Of course, being loud alone isn’t a great thing; you also need to actually reproduce music in a pleasing way. This speaker does hit that mark as well, producing accurate sound that doesn’t veer too heavily towards all-encompassing bass or tinniness like many of its peers. Instead, you get a relatively bright sound that suits most musical genres, from pop and rock to jazz and classical. The Poweradd is perhaps a little lacking when it comes to bass compared to a full-size monitor, making the speaker less well-suited for D&B, but it produces an impressive amount for an allegedly portable speaker. However, we noted that the Bluetooth connection does result in noticeable quality degradation when using lossless recordings, so we recommend using the 3.5mm connection if it’s practical to do so (e.g. if the speaker is being used in a fixed position for an extended period). However, the Bluetooth connection was stable and didn’t drop out in our testing, something that has happened with many other Bluetooth speakers we’ve tested over the years. The Poweradd justifies its bulk with the inclusion of a hefty 4000mAh battery which is good for up to 24 hours of listening, according to the manufacturers. We received the speaker about half charged, and were able to listen to music for about eight hour before the speaker cut out, so we’d say that you could probably expect between twelve and sixteen hours of playback at a reasonable volume — pretty awesome. Of course, that number will go down if you use the speaker to recharge your phone, making this feature an emergency option rather than something you’ll use constantly. The biggest flaw we found with the speaker were its controls; their tactility has been compromised in order to ensure the speaker’s water and dust resistance. That’s a shame, as it can make changing the volume a very tedious affair; you’re better off using your smartphone if you want to turn the sound down quickly. However, anyone that uses the speaker near water or in dusty conditions will certainly appreciate the inclusion, and it’s not enough to seriously dissaude us from recommending the Poweradd. The Poweradd Bluetooth speaker is a bit of a beast, a big and heavy speaker that stretches the definition of ‘portable’. However much of a drag it is to bring this speaker along, you’ll at least benefit from room-clearing volume, bright and friendly sound reproduction and a rugged all-environments design. For most people the Poweradd speaker will be overkill, but if you want a bigger speaker that delivers more of basically everything, you won’t feel too hard done choosing this one!